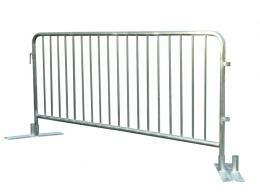 Metal crowd control barriers are an easy way to create temporary boundaries that are both sturdy and secure. They can be used anywhere a large amount of people will need to be kept out of certain restricted areas – concerts, sporting events, construction areas, processions, and more. The Workplace Depot’s stock of metal crowd control barriers will stand up to any kind of weather or abuse. Businesses, organizations, companies, schools, and more would all benefit from investing in these barriers for any of their large events. Our Detachable Leg Metal Crowd Control Barriers are made of heavy duty galvanized metal. They can be linked together for a long barrier, or used individually for smaller spots. The rotating legs detach for ease of transport. The Workplace Depot’s Fixed Leg Crowd Control Barrier has a design that is all one piece, which makes for quick setup. They’re stackable and have a hot-dip galvanized finish for strength and durability. They will stand through all kinds of weather and are perfect for outdoor events. For the ultimate in crowd control, our Police Barrier is the right choice. It’s welded with a galvanized construction for durability and longevity. It has greater stability as well as a higher impact ratio than standard metal crowd control barriers. This means it provides crush control as well as crowd control – it will stay standing even with a large crowd at a huge event pressing in. 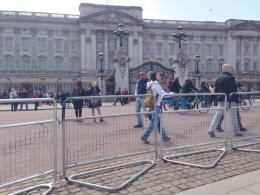 For increased security at a major gathering, you need a Police Barrier. The Workplace Depot offers free delivery on all products. 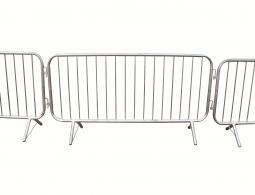 All metal crowd control barriers come with a standard one year warranty that includes parts and labour. Order with us today for any of your big events.